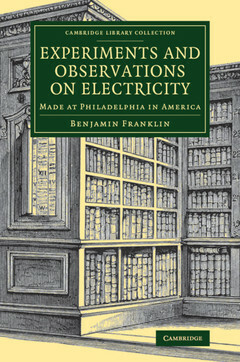 The political legacy of Benjamin Franklin (1706?90) has tended to overshadow his inventions and scientific discoveries, but this work, of which the 1769 enlarged fourth edition is reissued here, gathers together published and unpublished letters which demonstrate the range of his interests. A large number (many addressed to his friend, the English botanist Peter Collinson) are about experiments with electricity, but (as the subtitle, 'to which are added letters and papers on philosophical subjects', makes clear) others discuss the setting of words to music, the warming of water by pumping, and how the speed of a boat varies with the depth of the water it moves through. The letters (and some replies) show a lively transatlantic group of scientific friends and colleagues describing their experiments, interpreting each others' results, and theorizing on all aspects of the natural world. Franklin's three-volume autobiography is also reissued in the Cambridge Library Collection. Advertisement concerning this fourth edition; Preface to the first edition; Letters I-V; Additional papers, 1749; Letters VI-XIII; Remarks on the Abbe Nollet's letters on electricity, by Mr David Colden of New-York; Electrical experiments together with some observations on thunder-clouds, in further confirmation of Mr Franklin's observations on the positive and negative electrical state of the clouds, by John Canton, M.A. and F.R.S. ; Electrical and other philosophical papers and letters; Letters XIV-XXIII; Accounts of water-spouts; An account of the new-invented Pensylvanian fire-places; Letters XXIV-LXI; Index.